So I bought an AT&T data plan earlier today. SIM-only, no contract. Pretty cool, since their less-than-a-month-old 3G network around here is still pretty speedy. I didn’t need an aircard as I purchased a Sierra Wireless USBConnect 881 back during the days of “unlimited” GoPhone data for $20. The card lay dormant after “unlimited” became 100MB (big difference) but today it meant the difference between signing a contract (aka not getting service) and not signing one. One problem arose when I got home: my aircard kept switching to EDGE during the middle of a data session. Not a good thing for a $60 + taxes and fees data plan. So I needed to force 3G on the card. The problem there was that only the Windows Sierra and AT&T clients allow forced 3G. So (not knowing that settings are stored on the modem and thus once I set 3G-only on my Windows computer it would be 3G-only on my Mac) I scrounged around and found this page. I followed those instructions and was able to make sure my aircard was 3G-only. If you don’t want to read through a (relatively short) page on how to kick your aircard into high gear, you’re in luck. Here’s what you’d do on a Mac to force-3G a Sierra aircard. Note that this procedure was performed on OS X 10.6.1 and with the Apple “native” driver installed (a tiny download from here). This is also with the latest modem firmware, which I had to use the Sierra driver (vs. the native one) to upgrade to. Type in screen /dev/tty.wwanCMD 115200 and hit enter. Type in AT!band? and hit enter. If you see the number 02, you’re already locked into 3G-only mode. Otherwise, type in AT!band=02 and hit enter to set the mode. If you wanted to go 2G-only, the code would be 04 instead of 02. AUtoselect is 00. 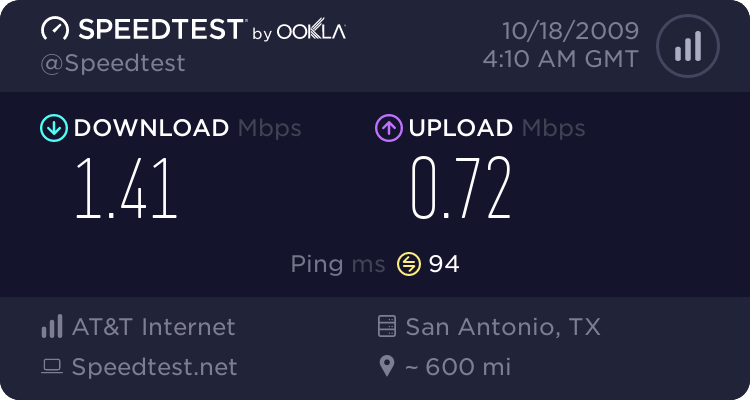 In comparison, SPrint usually pulls down 1.3 Mbps down, 300-500 kbps up and gets a B on connection quality.